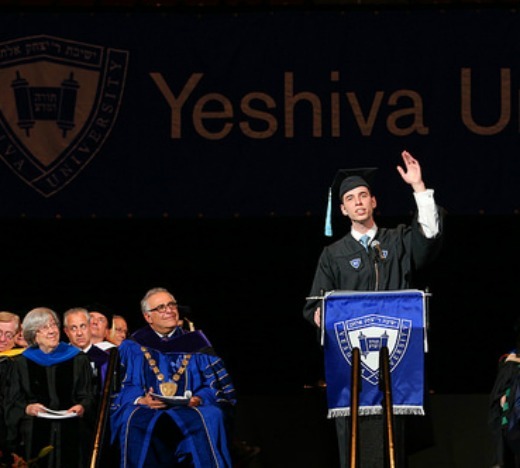 The following has been adapted from Mark Weingarten’s valedictorian address at Yeshiva University’s 2015 commencement on May 17 (Yom Yerushalayim). Thank you Rabbi Joseph, President Joel, honored Roshei Yeshiva, Rabbi Schachter, Rabbi Penner, faculty, families, friends, my fellow graduates. Mark Weingarten delivers the valedictorian address at YU’s 2015 commencement. Perhaps this pining is not merely reflective of a quest for national redemption, but a personal redemption as well, a desire to not only regain access to the physical Jerusalem, but to retain a Jerusalem perspective, a countercultural existence which prioritizes faith in a world of skepticism, community in an age of individualism, the past at the dawn of the future. This is at a time of growing pressure to neglect our Jerusalem in order to wholeheartedly embrace our fast paced futuristic society which exalts the individual and distances itself from its past. Six years ago, I experienced this pressure like never before. As the deans have made public, I had been accepted to Harvard College, the crowning achievement of my young academic career. As a 17 year old I rejoiced over the opportunity to take advantage of all that such a renowned institution had to offer. Yet doing so would come at the high cost of a hiatus from my Torah and Talmudic studies, and the sacrifice of an opportunity to expand my knowledge of how they engage every facet of life as one comprehensive breathing organism. The thought of putting my religious studies on hold, dismissed readily at first, started to gnaw at me. Have I forgotten you, Jerusalem? And so I chose to give up what for the average student is America’s greatest honor for reasons that to many would seem ludicrous, to study in the halls of Yeshiva, an institution with mentors and peers who quietly pursue a timeless treasure, pearls hidden under weatherworn shells that can be missed when viewed from our society’s lofty pedestals. However, my story is not unique. Ultimately, each of us has a Harvard, each of us has a Jerusalem. These great poles need not be diametrically opposed to one another. Our desire to pursue glory in our careers yet give our undivided attention to our families; to seek publicity while like Odysseus we long for a private life free from the public eye; to abolish the barriers that separate us from our neighbors and contemporary culture even as we remain steadfast in our tradition. There is much to learn and to be gained from society’s greatest institutions. But what is their worth without Jerusalem? What is the value of a life filled with accolades, if not channeled for a greater, eternal purpose? If we pursue societal standing to the extent that we overlook those things which our civilization discards but often are of the greatest value. Jerusalem has always tolled in our hearts. Throughout the last four years we have worked to cement it in our minds. We have had incredible mentors, in our families, Roshei Yeshiva, professors, and each other; individuals who radiate the warmth of the white walls turned gold in the sunlight, who display unparalleled kindness, humility, dedication to their heritage, and a passion to contribute to the broader community. Together, we have forged a synthesis and bridged two worlds, embraced our studies, activism, and service without compromising on our tradition. On the contrary, our heritage, our Mesorah, has endowed us with a singular perspective, a quest for truth, sensitivity and empathy which pervades all of our endeavors. And so we proudly proclaim that today, we remember you, Jerusalem! As we finish classes or work late at night yet wake up early to pore over ancient words that come alive, that endow us with a unique worldview by which the medieval representation of a downtrodden and blindfolded Synagoga regains her sight, we remember you, Jerusalem! As we gaze through a microscope at the power of human progress, yet pause to appreciate the complexity of creation and the vastness of our own limitations; as we embrace our syncretic role as knights of faith in a modern world, we remember you Jerusalem! As we bask in the technological advancements of our generation, yet channel those innovations to start an international initiative called Music Vs, to engage elderly and veteran populations whose contributions may have been forgotten, as we learn from the past in order to build a better future, we remember you Jerusalem! As we submerge ourselves in the freedom of summer or in the intensity of exams, yet surface immediately, dropping everything when we learn of three abducted teenagers, or pious men slain at prayer, who inhabited and embodied the essence of the city of gold, strangers, on whose behalf we unite in thousands to cry out as if we had known them all our lives, we remember you Jerusalem! As we entrench ourselves in building our communities and professions, yet realize that Jerusalem is not merely a metaphor. As we expand the influence of Yeshiva around the continent yet yearn to live in peace in our homeland, and its living breathing cities once more, we remember you Jerusalem! The Talmudic Tractate Ketubot which we studied this year concludes with the value of living in Jerusalem. The Talmud, as elaborated upon by the 17th century commentator Rabbi Shmuel Eidels, the Maharsha, expounds the verse in Psalms “and of Zion it shall be said, this man and this man were born in her” to mean that there are two categories of people who are considered children of Jerusalem – those who are born there, and those who are not there yet, but constantly yearn to maintain a Jerusalem perspective, who realize that it is critical to try, to aspire to dwell within her walls. Today we embark on our individual paths, where we will face battles to retain Jerusalem in defiance of world opinion and contemporary culture. As we climb the helix of public and professional life, let us first allocate time to delve into our heritage, give a hand to a stranger, and call those closest to us to let them know that we remember, and just how much we care. May we always be known as men and women of Jerusalem. 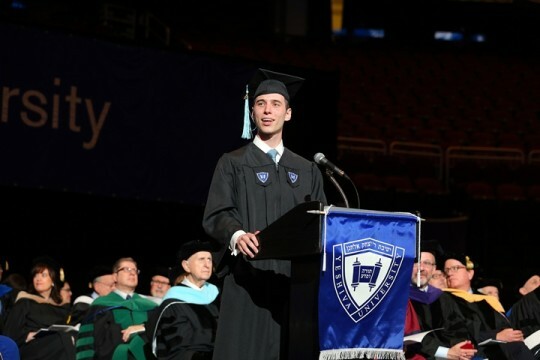 Mark Weingarten is the 2015 Yeshiva College valedictorian and the founder and executive director of Music Vs., a student-run initiative that facilitates intergenerational relationships with the elderly and ill through music. He was named to The Jewish Week’s 36 Under 36 in 2014. The opinions expressed above are solely those of the author and should not be attributed to Yeshiva University..